HUGO. For a while, I was frustrated with Martin Scorsese. Duped by my fixation on the visual and narrative style of Goodfellas (my jumping-off point), I mistakenly thought he'd taken a turn for the blander in his later films. I realize now that his inimitable directing style has evolved to suit each script -- form following function, I guess you could say. His latest is a perfect example of this ability, marrying some of his trademark visual cues to a story that describes, in roughly equal measures, childhood loneliness, wonder at the workings of the world and the magic of cinema. Hugo is the story of Hugo Cabret (heartbreakingly played by Asa Butterfield), an orphan whose drunken, absentee uncle conscripts him to maintain the clocks inside a mammoth, Lost Generation-era Paris train station. 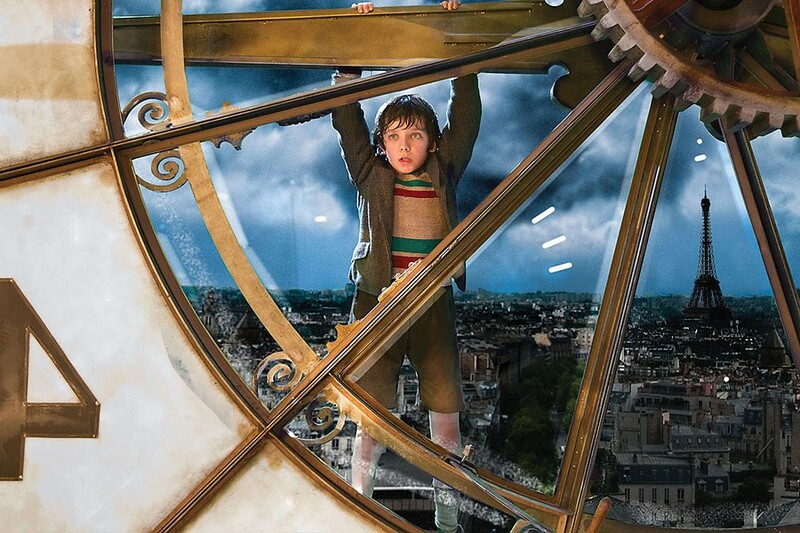 Literally left to his own devices, Hugo lives in secret, constantly evading the orphan-nabbing station inspector (a brilliant Sacha Baron Cohen) and struggling to restore a strange automaton left behind by his beloved clockmaker father. Along the way, Hugo also becomes a vibrant paean to cinema, particularly the work of visionary turn-of-the-20th-century director Georges Méliès. This is Scorsese's most concise, heartfelt love poem to the movies yet, and it's a joyful thing to watch. The feel of Paris, the beautiful intricacy of machines, the fear and triumph of childhood and romance -- all are gorgeously and meticulously depicted. This is a fun, exhilarating adventure punctuated with perfectly executed physical comedy -- including nods to Keaton, Chaplin and other greats. Suitable for almost all ages, this is a fine work from one of the greatest filmmakers ever. And I am thankful. PG. 126m. In 3D at the Broadway and Mill Creek. THE MUPPETS. If you are of a certain age (read: mine) the Muppets are a permanent part of your cultural context. I am a fan, though not a fanatic, so it was with some trepidation that I first read about writer/actor Jason Segel's intent to revive Jim Henson's iconic menagerie, at the time locked in some dank Disney dungeon. "Reboots" are all the rage in Hollywood these days, and I worried that Segel et al intended to hipsterize our old-time favorites or recast them in some unseemly retro light. But to my relief, the filmmakers -- including director James Bobin (Flight of the Conchords) and co-writer Nicholas Stoller (Segel's collaborator on Forgetting Sarah Marshall) -- have created an apt, unironic addition to the Muppet canon. The central conflict (corrupt tycoon buys the Muppet theater under false pretenses so he can raze it and drill for oil) is a little hackneyed, as is the "getting the band back together" second act that leans on it, but I never really watched the Muppets for complex plots. I watched the Muppets for the Muppets, for the earnest simplicity of their humor and their lack of cynicism. This time out, we get that in spades. Segel and co-star Amy Adams play it right, basically staying out of the way of the stars, except when called upon to make eyes at each other or break into a musical number. And the movie is peppered throughout with fun cameos, though some of the actors don't get enough screen-time. I'll allow that the jokes aren't all winners, and the big finish could be bigger and more breathless, but those are pretty minor criticisms, especially considering that I would gladly have re-watched The Muppets as soon as it ended. PG. 103m. At the Broadway, Mill Creek, Minor and Fortuna. ARTHUR CHRISTMAS. One might suspect that the creative shtick of The Replacement Santa would be worn down to the nub by now. I'm inclined to agree, despite the noisy protestations of the creators of Arthur Christmas. To commend an animated movie for competence, serviceable voice-acting or aesthetics is not saying much -- a bit damning with faint praise. Any cartoon feature in wide distribution has to satisfy at least those basic criteria. The really good ones are set apart by crackling dialogue, smart jokes and, sometimes, a truly distinctive look and feel. As I've said recently, I love Christmas movies for the pageantry and for their ability, at their best, to capture the immature, joyous quality of the season. Done properly, they can transport us to a timeless wonderland where we set aside the grown-up, jaded parts of ourselves. There are moments of classic Christmas movie fun in Arthur, giving us satisfying glimpses behind the scenes in Santa's operation, which is cleverly re-imagined as a massive paramilitary gift-drop. But those moments are not enough to sustain the beyond-predictable story and frustrating bungling of the title character. Two-thirds of the way through I found myself squirming in my seat, restless and a little bored. PG. 100m. In 3D and 2D at the Broadway, Mill Creek and Fortuna. There's a bounty of great-looking films in release. Elsewhere. Humboldt County, sadly, is but a dangling link in the film distribution chain. And so, as we enter the final month of 2011, we must make do with one new film -- an Emilio Estevez movie that came out on Oct. 7 -- and the return of two that had already left local theaters -- The Ides of March and Moneyball. To quote a Dickens character, "Please, sir, I want some more." THE WAY. Now that the above gripe is out of my system, I can admit that this movie -- directed by Emilio Estevez, who also wrote the screenplay (based on Jack Hitt's 2005 book Off the Road) and costars with his dad, Martin Sheen -- doesn't look half bad. (It has an 80 percent positive rating on RottenTomatoes.com.) Sheen plays Tom, an American doctor who travels to France to pick up the remains of his only son (Estevez), a lost soul who died while attempting to walk The Camino de Santiago. PG13. 115m. At the Minor. On Sunday, the Arcata Theatre Lounge will show Home Alone, the 1990 holiday mega-hit that launched that precocious little Macaulay Culkin into doomed superstardom. PG. 103m. 6 p.m. The B-movie fun that is Sci-Fi Pint and Pizza Night returns Wednesday with a lineup of classic serials. Radio Ranch (1935) is a feature-length edit of "The Phantom Empire," a serial that gave Gene Autry his first starring role. That will be followed by Beyond the Moon (1953), another feature-length edit, this one taken from "Rocky Jones, Space Ranger." Saturday is World AIDS Day, and to mark the occasion the Humboldt County Library will screen We Were Here, a documentary released earlier this year that looks back at the arrival and impact of the deadly epidemic in San Francisco. The New York Times says, "The humility, wisdom and cumulative sorrow expressed lend the film a glow of spirituality and infuse it with grace." Sponsored by the North Coast AIDS Project. Admission is free. Finally, the Fortuna Theatre has a weekend-only run of Pokemon The Movie: White -- Victini and Zekrom. PG. HAPPY FEET TWO. Emperor penguins with famous voices dance to save the world from global warming. Go, penguins! PG. 103m. In 3D and 2D at the Broadway, Mill Creek and Fortuna. THE IDES OF MARCH. George Clooney directs and stars in this political thriller co-staring Ryan Gosling, Philip Seymour Hoffman and Marisa Tomei. R. 101m. At the Broadway. IN TIME. In a world where you stop aging at 25 and immortality can be bought, Justin Timberlake looks good. Rated PG-13. 110m. At the Garberville. IMMORTALS. Armies of shirtless bodybuilders battle for the future of humanity (see: exploding heads) while the Gods of Olympus, I dunno, nap or something. R. 110m. In 3D at the Mill Creek, 2D at the Broadway and Fortuna. J. EDGAR. Leonardo DiCaprio and seven pounds of makeup star as the late, tortured FBI director. Directed by Clint Eastwood. R. 138m. At the Broadway. JACK AND JILL. A feature-length parody of a bad Adam Sandler movie in which no one, including costar Al Pacino, realizes that it's a parody. PG. 91m. At the Broadway, Mill Creek and Fortuna. MONEYBALL. When assembling your baseball team, Brad Pitt says "Don't go with your gut." PG-13. 133m. At the Broadway. PUSS IN BOOTS. Three Shrek movies plus this solo outing. Five lives left, kitty. PG. 90m. At the Broadway, Fortuna and Mill Creek. TOWER HEIST. Ben Stiller and Eddie Murphy are avenging 99 percenters, and a Central Park skyscraper is America. Plus jokes. PG13. 105m. At the Broadway and Mill Creek. THE TWILIGHT SAGA: BREAKING DAWN, PART 1. Teen girl marries hunky vampire, gestates spawn of his undead seed. Meanwhile, jealous werewolf pal fumes. PG13. 118m. At the Broadway, Mill Creek, Minor and Fortuna.